Awww, poor dog! I hate how they just slap stupid Hello Kitty’s face on everything, and then suddenly it’s a HK product people want to buy! Even if I was to put a muzzle on my dog, which I wouldn’t, there’s no way in hell I’d use a Hello Kitty one. That looks like a knockoff! First Sanrio is know for great quality of plastic items….. NOT! The dog may be able to tear of this muzzle. Second, I do not see any padding in plastic muzzle or strap; this would me a major chafing issue in my opinion. As for aesthetics, it looks ridiculous and cheesy. However, a muzzle kind of reminds me of the Chenobites in Clive Barker’s Hellraiser series. Basically where you are made into one by the very things you covet. Is this an example of Hello Kitty repressing Free Speech? Admittedly it’s just dog speech, but that’s where it starts. What next? Hello Kitty Scold’s bridles? you are so right. As a future veterinarian… that muzzle is the worst crap ive seen. Awesome! I’m so sick of the neighbours’ dogs barking at my cat when he goes to pee in their doghouses! Mr Hello Kitty Hell, that’s a great idea. Kelsey, can you send in a photo of yourself wearing the muzzle? This is just horrible, horrible, horrible!!! I agree this is NOT a real HK product, and the muzzle looks like nothing more then a torture devise! Looks to me like someone bedazzled a kids toy and then thought it would be funny (which it’s not) to put it around the dog like a muzzle. If I were the dog I’d bite whoever did this to me it hopes of getting some brain waves moving through their clearly empty head! Better question, who the hell is Kelsey? And why would you want a picture of her wearing a muzzle? I too would not trust this not to break… but on the other end of the spectrum I blame the owners who make the animal so mean that it needs a muzzle! You know this may sound mean, but the dog looks like it doesn’t really care. Not saying you should leave it alone on the dog, but it doesn’t look like it cares. But wierdly enough, I’ve seen animals go for stranger things. It’s much more interesting to see a human wearing a silly plastic toy than it is to see a dog wearing one. That must be what silenced the demented darlene. Go ahead and say it, it isn’t the best looking dog around. I think the dog looks like the Simpson’s dog, no?? Stupid, that’s a Greyound. I can guaran-damn-tee it looks better than you. yes, i agree. i know her personally and she should wear that muzzle because she looks like a dog. I doubt the muzzle would break. It is a basket muzzle. If you look them up you will see the plastic ones all look very similar to that one. I happen to like Hello Kitty, but this is crazy. I work in a vet’s office and know that in order for a muzzle to work properly, it has to be soft on the sides. That way it doesn’t bother the dog. This muzzle was probably bought at the 99 cent store,and a sticker was placed on it. I think Kelsey sent it in to display what she can do with so little. Not impressed, and there’s a reason why no one knows who she (or he) is. Ha ha ha!!! HK shuts the dog’s mouth up! dude you people are a bunch of morons. first of all, this was made a person and sold on etsy. yes, the website where people sell ugly crafts. secondly, quit screaming about how uncomfortable it looks. every greyhound owner has to have a muzzle. WHY? because greyhounds are prey driven dogs who will chase small animals and possibly (but not always) kill them. the dogs wear the muzzle while doing their duty outside for about five minutes PER DAY. get over yourselves. this is a preventative measure FOR THE DOGS to keep them from eating a diseased animal, and so that their owners don’t have to clean up a halved chipmunk. and mary, you don’t sound like you encounter many greyhounds at your vet office. I never wrote that a muzzle was not required, however, i did write that the muzzle should be comfortable. IF a muzzle is not properly insulated, it can irritate the canine’s skin, causing breakage and potential bleeding. seriously, that dog is gonna need therapy! Forget the hello kitty on the muzzle which the owner slapped on himself. All of these comments minus Alp’s, are ignorant and stupid. 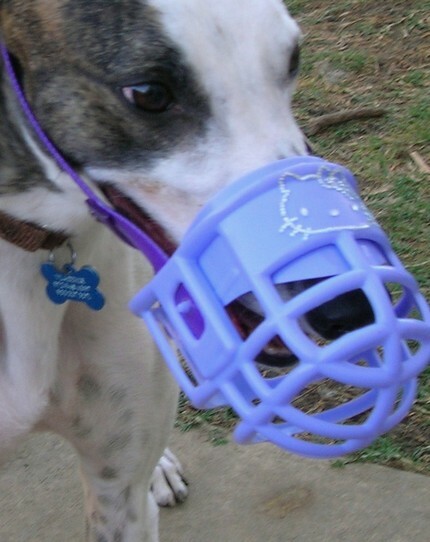 This basket muzzle is on a greyhound, specifically used for sighthounds. It is never really on them for long periods of time. Any greyhound owner or rescue organization will tell you to absolutely have one. Do you actually think people leave this muzzle on the dog at all times?! Don’t be an idiot. These kinds of muzzles are worn for everyone’s safety. Not because the dog is aggressive but because they are prey driven, and for the simple protection of dogs, mainly other Greys. When they race or are together in a group they always wear them because a simple scratch to a regular dog could be a serious laceration to them due to their thin skin. So is it hurting her or uncomfortable, no it’s not, they are very used to them. So stop with all the bull. That is really sad and really ugly. Poor dog.